The Confession of 1967 is remembered and celebrated in these papers from a 2002 conference at Stony Point Center. A diversity of authors discuss the evolution of C67 in conjunction with the Book of Confessions and offer reflections on continuing challenges in the areas of race, poverty, war/peace and gender relations, as well as challenges that have emerged since 1967. An Inclusive Language Text is included, as are study questions and additional resources. Actual shipping charges apply to this order at the time the order is processed. 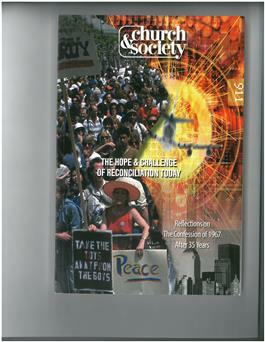 Visit www.pcusa.org/acswp/church-and-society.htm to download magazine covers and tables of content.